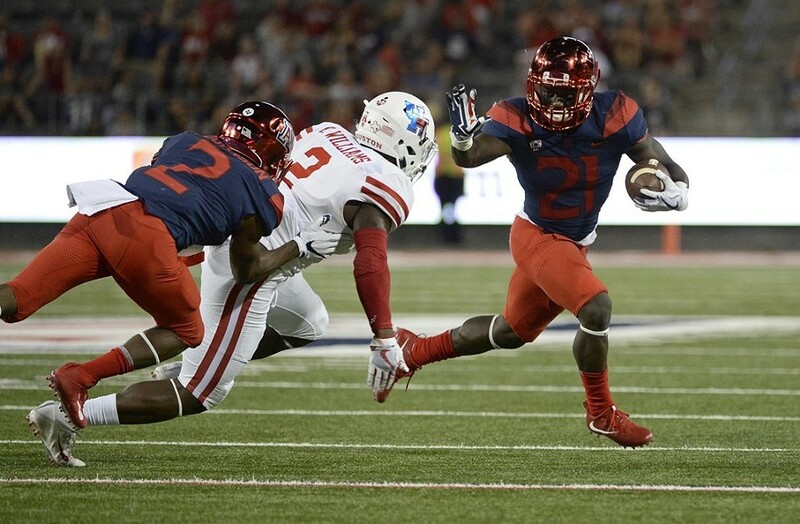 Arizona running back JJ Taylor tries to outrun University of Houston safety Khalil Williams during last year's 19-16 victory by the Cougars in Tucson. Welcome to week two of the college football season, where the University of Arizona Wildcats already face a must-win game on the road in Houston on Saturday. The 'Cats, like many of their most fervent supporters, looked rather sluggish in their season opener against Brigham Young University during Labor Day weekend. They were able to move the ball in fits and spurts on Saturday night, with 197 passing and 129 rushing yards to their name. The problem was their inability to disrupt the BYU Cougars' offense, surrendering 392 offensive yards to a team that went 4-9 a year ago. The result of that inefficiency was a glaring L in the record book for coach Kevin Sumlin in his debut, falling 28-23 to the BYU Cougars in front of an announced crowd of 51,002 at Arizona Stadium. Sumlin guides the Wildcats into familiar terrain this week, having coached in the Space City for four seasons (2008-11), posting a 35-17 record with the UH Cougars. His new squad faces a daunting task on multiple levels, having to play Saturday's contest at 11 a.m. Central (9 a.m. Arizona time). They also have the unenviable task of trying to slow down Houston's dynamic defensive tackle Ed Oliver, who's a bonafide top-five pick in next year's NFL Draft. Both feats will be tough for the Wildcats to surmount, resulting in Vegas picking the Cougars as a 4.5-point favorite, as of Wednesday morning. Can Khalil Tate Find His Rhythm? Expect Tate to have much more liberty to run the ball this week, with the fate of the game hinging on his ability to execute the team's read-option attack properly. Can anyone stop (or even slow down) Ed Oliver? Ed Oliver will be the toughest task for an undersized and inexperienced Arizona offensive line come Saturday morning. Oliver, who was an All-American as a sophomore in 2017, didn't miss a beat in Houston's opener against Rice, with 13 tackles in the Cougars' 45-27 win. It'll be interesting to see if the Wildcats double-team Oliver, using multiple linemen (or a lineman and a tight end/running back) to slow down the junior tackle. It'll be up to the likes of redshirt sophomores Tshiyombu Lukusa, Josh McCauley and Bryson Cain at left guard, center and right guard to inhibit Olivers' pass rushing abilities. It's a mighty tall task, but one that will determine whether the Wildcats leave Houston in free-fall or with momentum at their backs heading into their final non-conference game against Southern Utah. Can the Arizona pass defense make stops when it counts? Perhaps the most frustrating thing for third-year Defensive Coordinator Marcel Yates' unit in last Saturday's opener was its inability to stop BYU when it mattered most. The Wildcats defense, which was expected to be much improved this fall, surrendered 392 offensive yards to a Cougars offense that just over 325 yards per game last season. What's worse is that they allowed BYU quarterback Tanner Magnum all day to throw, with the senior completing 18/28 passes for 209 yards and a touchdown. The Wildcats didn't force a single turnover against BYU, despite the Cougars averaging more than two a game last season. The Wildcats' pass secondary was a non-factor against the Cougars, with four pass deflections and zero turnovers forced, against a BYU squad that finished 117th in the nation (out of 129 teams) in turnover margin last season (committing 10 more turnovers than their opponents). It'll be interesting to see what alterations Yates and Sumlin put in place against a Houston offense that put up 320 passing and 257 rushing yards against Rice in week one. How to Bet: Vegas has the Houston Cougars as a 4.5 point favorite, as of Wednesday morning, down from the opening line of -6. How to Watch: ABC will broadcast the Arizona-Houston game live at 11 a.m. Central (9 a.m. Arizona time). Who to Watch: Keep an eye on Ed Oliver (mentioned above), as he's probably the best player on either side, from a talent perspective. Also, watch out for Houston's junior quarterback, D'Eriq King, coming off a phenomenal season opener where he threw for 320 yards and three touchdowns, with 33 rushing yards and a score on the ground as well. It'll be up to Arizona's defensive stalwarts, like Colin Schooler (16 tackles against BYU), Isaiah Hayes (13 tackles) and Tony Fields II (11 tackles) to contain King and the Cougars in the early hours of Saturday morning. Who Will Win: It's hard to bet against a well-oiled machine, which is exactly what Houston Coach Major Applewhite has. I'm going with Houston winning this one by a score of 42-28 over the Arizona Wildcats.